ID Security has scrutinized the performance of two new printers�the Magicard 600 and Fargo HDP6600�and they�ve made a great impression. If you�re searching for a reliable card printer to consistently produce quality cards�employee ID, credit, debit, identity, access, loyalty, public transportation passes and more�take a look at these two winners. The Magicard 600 delivers great high resolution and can print at an impressive 600x300 dpi, legibly capturing tough-to-see micro text. This entry-level business-class printer offers a wide color spectrum for rich, vibrant visual effects. One significant improvement�a faster print speed per card (up to 200 color and 720 monochrome cards per hour). 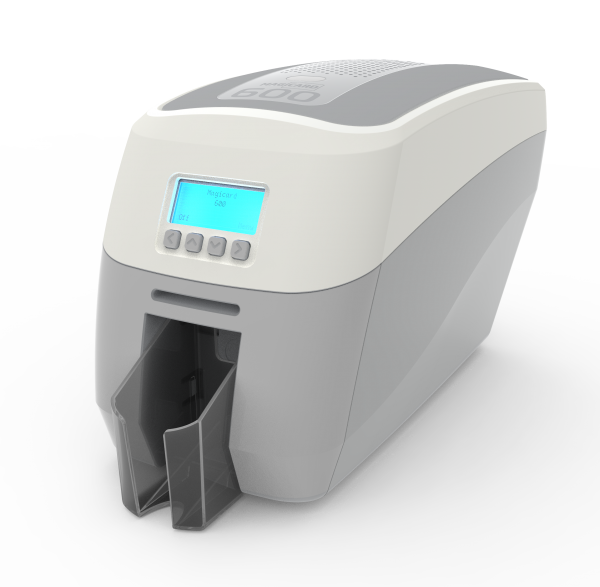 Anti-Fraud � This new printer offers updated HoloKote and Custom HoloKote options, and is powered by the all-new LYNK onboard intelligence�for identity with an IQ. The 600 lets users print a HoloKote� security watermark across the card surface, which can be customised to an organisation�s logo, or other unique security design. Users can select from 10 predesigned HoloKote watermark images built into the driver when adding a watermark-style design to cards, and can add as many as 10 unique stored Custom HoloKote designs direct to the printer via Magicard�s web tool. This feature takes customized security to a new level. Moreover, when using HoloPatch� cards users can highlight an area of the HoloKote� watermark to create a high-visibility security seal. Digital Shredding � Another ultra-secure feature is digital shredding to ensure data used to create cards can�t be recovered from the system by not-so-well intentioned third parties. This Magicard 600 feature fragments data used for a print job and renders it unrecoverable, preventing the printer from storing data. Threat Benchmarking � Magicard moves regular software updates to every users� Margicard 600 unit to ensure the software and system configuration is protected against all current security vulnerabilities. These updates are based on threats identified through regular security scans against Nessus Pro, a widely deployed comprehensive vulnerability assessment tool. ID Cards � Print high-quality ID cards for employees or students, or issue highly-secure government credentials, to identify every person at a glance, using the HoloKote customizable logo or security design watermarks. Access Control Badges � Use the in-line smart card encoder at the point of issuance to write physical access data to the card, then track who enters and exits properties and places with access-control badges to secure the enterprise, school, building, or area. Payment Cards � Payment cards, gift cards, or IDs with cashless payment options can be printed and encoded on the spot using an inline EMV encoder. Time and Attendance Badges � Track employees, visitors or students and even print a schedule on card backs. Loyalty Cards � Boost sales, create value for existing customers, and attract new clients with stunning loyalty cards. Membership Cards � Print sharp membership cards to offer special incentives to customers and facilitate access to secure areas. The Magicard 600 ID Card Printer is a world-class printing solution that cost-effectively produces badges in high volumes with rigorous security in processing ID credentials. It�s many high-end features integrate readily with existing infrastructure, deliver excellent performance, increased capacity and improved print quality, single or dual-sided printing, and optional encoding capabilities. 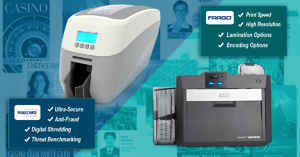 The Fargo HDP6600 ID card printer is the newest addition to Fargo�s HDP line. It�s fast, innovative, feature-rich, and reliableI. If you�re looking for an enterprise-class desktop-based retransfer printer with a comprehensive set of innovative features and options not available elsewhere, this one has what you�re after and knocks it out of the park. The innovative HDP6600 (produced by Fargo in combination with HID Global) has as-yet-unseen features and print speeds of up to 230 cards per hour (YMCK with transfer). It�s exceptionally advanced and highly efficient�delivering simultaneous print and retransfer, GreenCircle� certified energy savings, and patent-pending iONTM technology for unparalleled printer readiness. 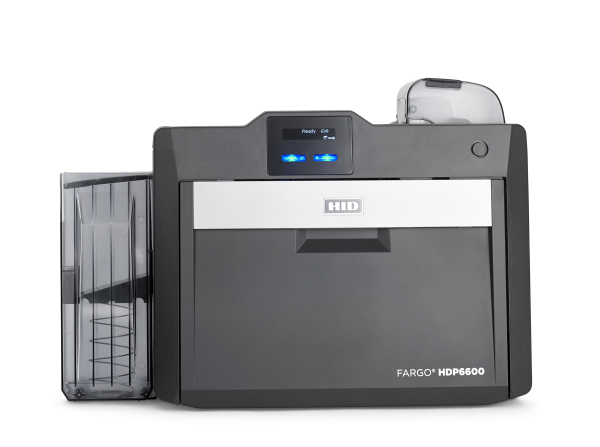 With many years of proven retransfer printing expertise, Fargo brings some great new features with this printer�security, lower cost, innovation, and versatility is all standard with the HDP6600. Print Speed � For many organizations, card printing speed is essential to avoid process-flow bottlenecks and administrative inefficiency. 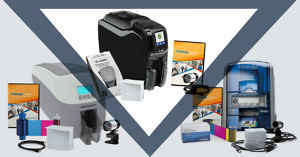 Users in fast-paced operating environments need to maximize productivity, and a key consideration when selecting an ID card printer is the user�s anticipated ID-card print volumes and the printing rate necessary to accommodate those �crunch� production times when print volume and pace must keep up with real-time workflow. This printer can reduce wait times significantly. The HDP6600 delivers the fastest desktop-based retransfer printing speeds on the market today�producing high-definition cards at an unprecedented pace. It�s designed to meet high-volume needs and expedite large-production jobs in the most demanding circumstances. To improve system capacity, users can opt for the 200-card input hopper. High Resolution � By applying ink to cards at a 600-dots-per-inch resolution, the HDP6600 produces brilliant colors and very sharp images�especially useful for printing readable small text, complex characters, and crisp bar codes. For users, this means flawless-, professional-looking cards that enhance the organization�s brand identity and ensure instant visual verification. No muddled visuals in this printer�s output. In short, the HDP6600 produces ID cards with the highest image and text quality available�a priority for enterprises that depend on brand images. 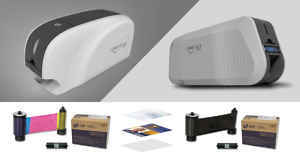 Lamination Options � The HDP6600 offers users the choice to use one lamination material for one or both sides of the card, or to use two different lamination materials on different sides of the card. Single lamination may work great for an ID card that only requires a durable clear laminate patch. 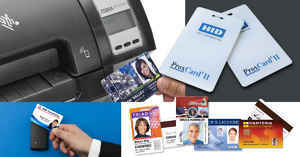 But for multi-purpose credentials, users may need a two-material lamination, e.g., a custom holographic laminate on the front of a multi-use smart card, and a half-patch laminate on the back to protect bar codes or leave a magnetic stripe unimpaired. 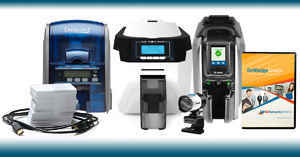 The HDP6600 card printer/encoder offers high-capacity consumables (which are both convenient and lower cost) and a comprehensive feature set�including robust data-encoding features�enabling organizations to quickly issue highly secure cards and IDs at a fraction of the cost without sacrificing quality. As the only desktop-based retransfer printer available featuring advanced wasteless lamination technology, the HDP6600 can reduce high-volume laminate materials costs by up to 40%. Beyond consumables cost savings, wasteless PolyGuard� LMX overlaminates extend card life by providing the highest level of card coverage protection. Encoding Options � Speaking of security, the HDP6600 offers smart-card encoding such as contact and contactless encoding, along with typical magnetic-stripe encoding. New in these printers is the ability to read proximity and iClass cards. With support for just about every encoding technology, users have true card-printing flexibility can create any card type � credit, debit, identity, access, loyalty, public transportation passes, and more. This is true encoding flexibility�and the HDP6600 supports it all. Ideal for any enterprise that needs retransfer printing technology to reliably issue secure and durable, high-definition IDs or cards at high speeds, the FARGO� HDP6600 from HID Global is a cost-effective, eco-friendly, and reliable solution for an ultra-low cost per card.